This was the first time Stetson participated in the competition, which drew 20 teams from around the country. 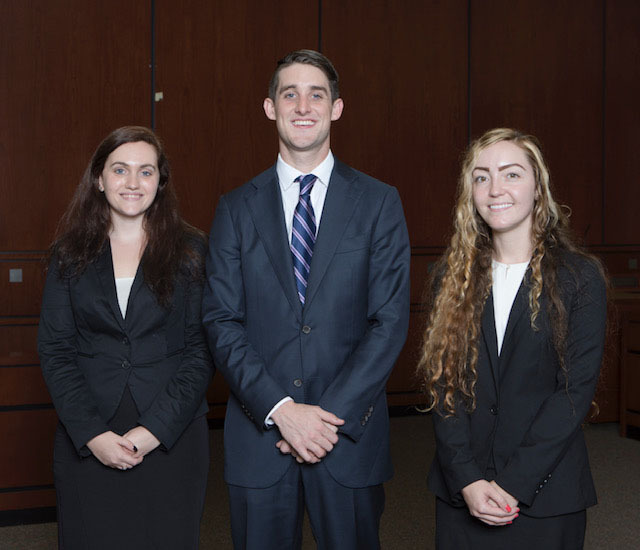 GULFPORT, FL, October 10, 2018 — The Stetson University College of Law team of Madison Wahler, Deanna Cipriano and James Nealon won the Leroy R. Hassell National Constitutional Law Moot Court Competition at Regent University School of Law in Virginia Beach, Virginia, on Oct. 6. Nealon also won the fourth best oralist award in the preliminary round. This was the first time Stetson participated in the competition, which drew 20 teams from around the country. Professor Brooke Bowman and Stetson Law 2005 alumnus Bill Wildhack co-coached the national championship team. In the final round, the Stetson students argued before a seven-justice panel, including a federal appellate court judge, the professor who drafted of record, and five state Supreme Court justices. The Stetson students were applauded for their poise and professionalism, as well as their ability to answer extremely difficult questions. Since 1980, Stetson's Moot Court Board has won four international, 28 national, and 22 regional advocacy championships, in addition to 61 best oralist and 55 best brief awards. Stetson has ranked the top law school for Trial Advocacy in the country 20 times in 24 years and has consistently ranked among the top six legal writing programs since the inception of the rankings in 2005. To learn more about trial advocacy at Stetson, visit stetson.edu/law/advocacy.